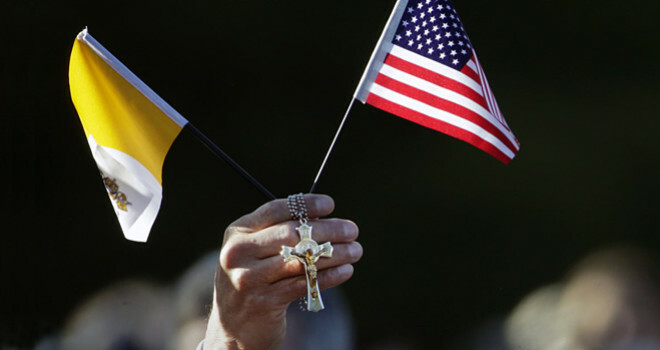 Catholicism in America: Bringing Order to a Disordered Politics. Is Catholicism in America to be increasingly relegated to discredited "Outsider" minority status, or might it actually restore Good Social Order? The American social slide out of order and into disorder is not irreversible and not inevitable and not dooming of the nation or of the religiosity of the citizenry, unless we all just stand by in silence and let it continue unopposed. If we are Catholic, we are supposed to speak up on important issues. But we don't, and that's the problem. What lit my fire on this topic is the article in Crisis Magazine, Catholic Ties to the American Public Order Continue to Unravel, by Kenneth L. Grasso. Not that the author is just standing by; quite the opposite, in his case. The article itself is standing up and speaking out in opposition to the trend. But it's the negative tone and seeming surrender to the inevitability of the eventual defeat of order that I take issue with. It does not need to happen. Just because we're a minority does not mean we can't do anything about our situation. In point of fact, history shows that minorities, when dedicated and committed to action, win more than they lose. The Communist "Revolution" with no more than 15,000 committed Party members, took over all of Russia and gave birth to the Soviet Union. The Homosexual Movement, representing a tiny minority in America and everywhere else, is now lionized and accepted in Western culture, and even within Catholicism, even more than is Catholicism itself, and even more than Protestantism. Because they were allowed to win. Because of too weak resistance. Today, you can't show me the "Conservative" who does not accept and tolerate the blatant atheistic Marxist ideology of the whole Marxocrat Party and so many sitting officers in all three branches of Constitutional American Government. The fact that Marxism is anti-American is now irrelevant and forgotten. Today you can't show me the "Conservative" who does not openly brag about the fact that he has family members or friends or employees or close associates and colleagues who are "gay", and who considers the normalizing and social elevation of homosexuality in culture to be the result of social "Progress". The fact that homosexuality is unnatural and harmful is "Old School". The Truth of it all is lost. Truth does not matter any more. Again, it doesn't have to be this way. Comrade President Obama (peace be upon him) was awarded the Nobel Peace Prize for merely existing. He in turn awarded the Medal of Freedom to Ellen Degenerate for "Heroically" bringing blatant homosexuality to regular TV broadcasting. But here's the important thing in this: They lost. Trump won. And if Trump is not perfect, at least he is listening to us, and moving in the right direction, however haltingly and with however many missteps along the way. To those who damn him for being no Catholic and a poor example of any kind of Christian, look at who he just defeated. Purer forms of unabashed evil may have never been seen in America. What the incorporation of evil Marxist ideology into the American psyche has brought us to is Secularism and Separation of Church and State, unconstitutional though they both may be. And through them, the ascendance of Moral Relativism. And once again, it doesn't have to be this way. Both of these legal monsters were and are unconstitutional, but they were not resisted enough, and so they stand, now just accepted, unrecognized as problematic, and completely unopposed. An unrecognized enemy ideology. Running the country. In war, the enemy most likely to take you out is the one, unrecognized, standing right beside you. Mr. Grasso correctly describes the rise of the Sovereign Individual in the new "Post Christian" order of things, emphasizing individualism over the common good, subjectivism over objectivism, and, of course, secularism over religion. This, he correctly points out, has given rise "the ideology of the sovereign self: a human being is simply a sovereign will free to make of himself and the world, whatever he chooses." Mr. Trump cannot stand disorder. Whatever else he may be, President Elect Donald Trump is an orderly man. His life and his businesses are well ordered. Whether through listening to what some of us have to say about it, or through his own natural inclinations, he will oppose chaos and disorder. And if and when he sees the root of all this disorder, he will attack that, too. only the Sovereign Constitution concept is right. Only strict Constitutionalism can restore order in America. a "conversion" from dominant Marxism, secularism and immorality back to simple American Constitutionalism. As Catholics, we should be leading the way in this actual war that is still not even widely recognized as being a war. And this war is being waged against enemies that are not even widely recognized as being enemies. But it is a war, and everything, especially freedom, is at stake here. Do you renounce Satan and all his evil works? Yes or no. If we Catholics cannot correctly answer that ancient question and show it by putting our faith to work, standing up, speaking up, and openly opposing Satan and all his evil works, in clear, unambiguous, unfiltered, un-PC language, then Satan wins again. By default. The worst imaginable way to lose both liberty on earth and everlasting life. Pray for President Elect Trump, that he might save America in spite of herself, and pray that more American Catholics might find a backbone. If E.C. elects Trump, then incitement of Trump camp outrage will simply be postponed (brought about another way). Trump Nationalist camp outrage -disappointment will lead to widespread violence. Naturally Globalist, Obama regime, Hillaryites, black power groups, many college students, liberals, immigrant groups, Muslims and MSMedia will crow that the Trump camp is totally to blame for the violence. Trump camp will also be accused of being Russian tool. Obama regime will: Claim emergency powers, suspend Constitution, end "sovereign" USA. That could be one of many possible plans aimed at the same goal. There are as many "Plans" as there are permutations and combinations of evil Globalist and Marxist conspirators with all their multi-varied factions of Useful Idiots and Agent Provocateurs. The problem with all such plans is their utter unpredictability, because unpredictability is the one constant descriptor of any purposely incited chaos and disorder. That is the nature of chaos and disorder. Once the mad dog is off the leash, there's no telling who he might bite first, or last. The real danger is, at least the enemy has a plan. We don't seem to have one. The Purpose of this grouping of links is to provide a record of the unique American political aberration of Donald Trump-ism. Neither Republican nor Democrat; neither Conservative nor Liberal; neither Christian nor Atheist; neither Fish nor Fowl; a stand-alone, determined, independent billionaire who just might save America from herself. Or, destroy her. Maybe. Donald Trump rose in the public estimation because he started talking about stopping the illegal invasion of foreign intruders into America, which was not only allowed, but encouraged by the Obama regime and the Democrat Party, and not stopped by the Republican Party. Untold millions were pouring across our Mexican border, for government benefits. The American government was doing this on purpose, and elements of the Catholic Church and others were supporting it. That is the single issue that put Trump at the top of all political polls and kept him there so long. Satanic Unreason in Modern Liberal Thought. Satanic Unreason, Unreality and Insanity rule the Left, in philosophy, theology, material science, mathematics, politics, psychology, you name it. Is Trump instinctively above it all? The Marxist Cloward-Pivoning of Trump's Administration. Overloading Government at every level of Marxist Organization. Trumping the Media, Trumping The Establishment, and Trumping Marxism. President Elect Trump is Trumping the System that has been running us into the ground, and he is just Trumping it "naturally". Catholicism in America: Bringing Order to a Disordered Politics. Is Catholicism in America to be increasingly relegated to discredited "Outsider" minority status, or might it actually restore Good Social Order? Emoticon Bigotry: the induced bigotry symptom within Emoticon Syndrome. The Educationally Induced Emoticon Syndrome project introduces Emoticon Bigotry, making the student a hopeless bigot, just like his teachers. The Making of Emoticons: Highly "Educated" Emotional Cripples. Our Universities are not merely cranking out anti-American Marxists, but also Emoticons. Trained Emoters, as opposed to trained Thinkers. Restoring USA: The simple (but difficult) task before our new President. Generations of unresisted Leftist damage and culture-rot cloud the simple task of restoring the original idea of the USA. Anti-God, Anti-Nature and Anti-USA. Breaking America's relationship with God and perverting man's view of Nature, first, in the Anti-USA Agenda of the Left. God, Nature and the USA. The unique relationship between God, the Author of Nature, and the "Natural" political organization of the USA, as Declared and as Constituted. Giving thanks for the Intercession of Our Lady, Queen of Heaven and Earth. Storming Heaven with Prayer must not end now; pray for Heaven's Guidance of President Trump. On the nature of Warfare, on the eve of 2016 Election Day. In this world, you can wage Spiritual Warfare, Political Warfare or Military Warfare. But standing neutral will not save you or your children from evil in this wold. PC Speech Control Vs. 1st Amendment Freedom of Speech: Place your bets. Politically Correct Speech Control is ever increasingly taking charge of Constitutional America. Is everybody happy? The "Pre-Existing Condition" Progressive Marxist Psychological Trick. Insurance is protection against future misfortune, not past misfortune. How could anyone insure against past events? We now clearly see all evil coalescing round Comrade Madam Hillary. All the forms of evil coalescing in Madam Hillary and her Party are at long last visible, and therefore defeatable, all at once. Rush hit another home run describing all the "PC Vapors" after the last debate. The whole Media, and even Glenn Beck, got the PC Vapors and nearly feinted, trying to shield the children's ears during the debate. Did Trump just Flip? He will now "deal" with Marxocratism and Obamunism? The Donald has flipped before, but this may be the flip to end all flips. If HE won't stop the destruction, WHO WILL? How "Trumpism" trumps pseudo-conservatism, and is not Obamunism. Trumpism: A turning away from the treacherous Republicrat Party's treason, toward the only imperfect alternative. Cruz and Trump Rise Again, and the Elites still don't get it. The Candidate who actually recognizes the existing war and then properly prosecutes it will win all the marbles. Trump Confounds the Republicrats and Flummoxes the Marxocrat Party's Media. Trump continues to confound the Left, including the "Bipartisan" Republicrat Party. A prayer for President Trump, that through him we may return to justice. That the huge responsibility may humble him to his knees, bless and inspire him to lead us in a return to True Justice. Trump v Clinton = Ignorance & Indifference v Machiavellian Evil. Choosing Trump v Clinton is easy; it's choosing amoral love of country v pure, deceitful, evil intending, flat out immorality.